It is time for my favourite post of the month – sharing another Busy Bag activity as part of the Busy Bag Blog Hop. 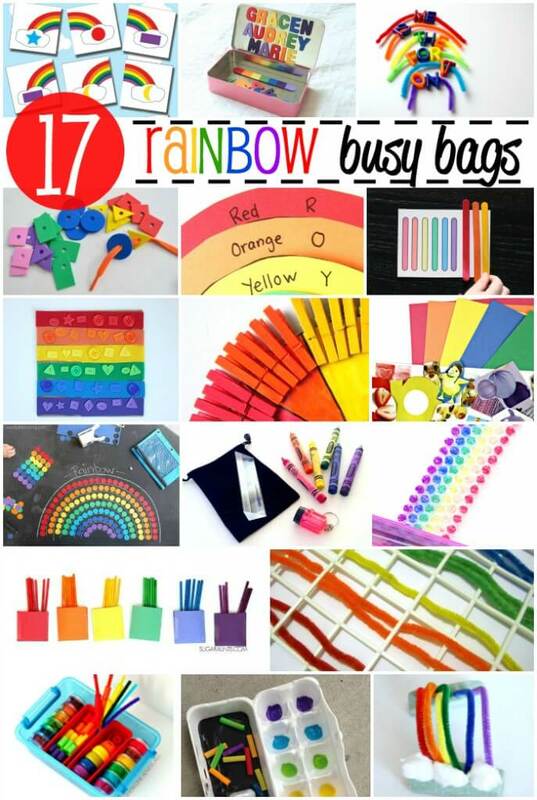 This month’s challenge was to make a Rainbow themed Busy Bag. After creating our Clothespin Heart for Red Ted Art I knew I wanted to continue with playing with pegs. So we created a Clothespin Rainbow Busy Bag. Painting the pegs was easy. I repeated the same method as we had previously used with our Clothespin Hungry Caterpillar. Ziploc Heavy Duty Freezer Bags (affiliate link) are perfect for painting lots of objects at once without getting messy. I simply squirted Baker Ross Ready Mixed Paint (affiliate link) and PVA glue into a zip loc bag, added 5 wooden pegs, closed the bag and handed it to Adam. He loves shaking the bags and ensuring that the pegs are covered in paint. I repeated the process until all 6 colours were used and then placed the pegs on baking paper and left them to dry over night. Using the left over paint from the bags I painted my hand drawn rainbow. I decided to create two rainbows to help Adam practise sequencing colours. Once the rainbows had dried I went over the lines with a thick black pen and laminated both rainbows. Laminating is not essential but it ensures that the rainbows are easier to hold and they will last longer. Adam took to the activity straight away. I helped him to hold the rainbow and he clipped on the pegs. It is a super activity for fine motor skills development. Adam had to use his pincer grip and hand-eye coordination to place the pegs onto the rainbow. The activity also helped to develop his perseverance, concentration skills and pattern recognition. Furthermore, the activity can be repeated again and again – we certainly love Busy Bags! What an awesome fine motor and color matching activity! !